2012 Fiat 500 Pros and Cons: Why (Not) This Car? Even without a lot of power, small cars tend to be more fun to drive than larger ones. Add power...well, it's been hard to say, as few of the many pocket rockets available in Europe have been making the trip across the Atlantic. 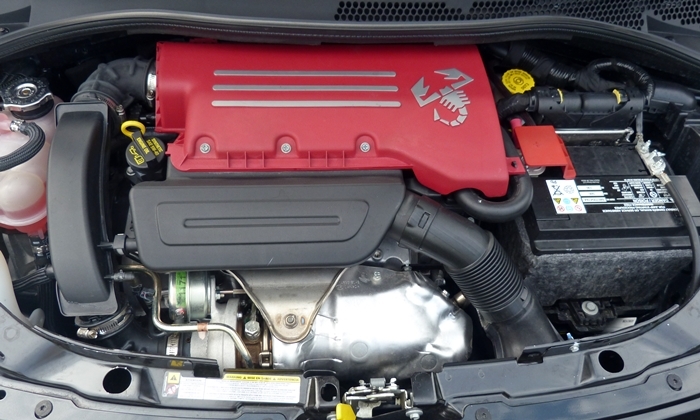 But the 160-horsepower FIAT 500 Abarth (pronounced ah-bart) is now here. What have we been missing? Red details here as well. Why the 2012 Fiat 500? It might be much more powerful than the regular FIAT 500, but people are still going to buy (or not buy) the Abarth due to its styling above all else. The exterior pays homage to the classic 500, which was essentially Italy's VW Bug, while also being attractive to contemporary eyes that like a lot of cute in their cars. The Abarth adds various red details and fancy scorpion badges on the fenders to convey that it's the high-performance variant. Among other small cars, only the MINI includes so much "design," making it the obvious comparison. 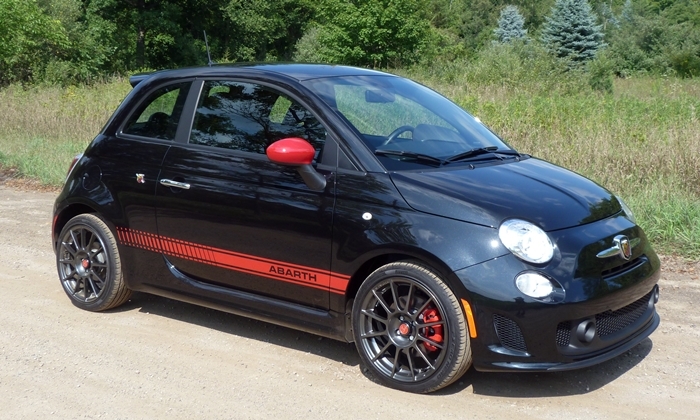 I was initially underwhelmed by the Abarth's performance. Then I recalled the "Sport" button largely obscured by the right side of the steering wheel rim. Hit it, and throttle response quickens while another 25 or so horsepower are unleashed, for a total of 160. The difference is dramatic. This is essentially the same engine as in the new Dodge Dart, but with about 800 fewer pounds to tote around (at 2,500) and a much louder exhaust full of unusually raw boom and crackle. This said, even in "Sport" performance remains short of mind-blowing. A MINI Cooper S, with another 21 horsepower up top and considerably more shove down below to handle its additional 140 pounds, gets by with fewer revs in daily driving and also proves a little quicker when both are wound out. A lot of design, but tach and audio controls hard to use. 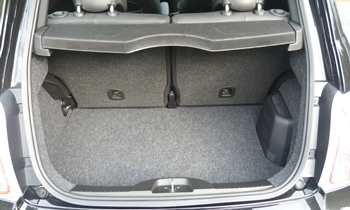 No car with a viable rear seat is smaller than the 500. 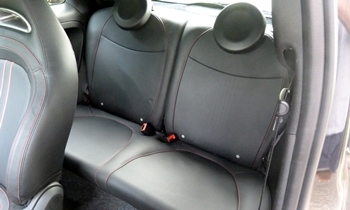 Even the MINI Hardtop, which has a tighter rear seat, is a half-foot longer. 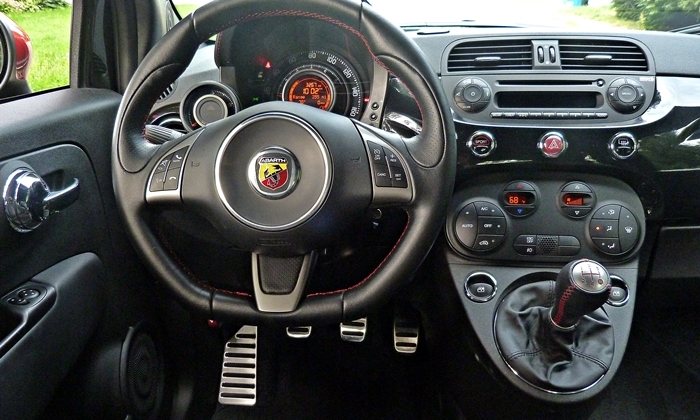 For this reason alone, the Abarth is fun to drive in a way the vast majority of cars can't be. Yet I expected better. 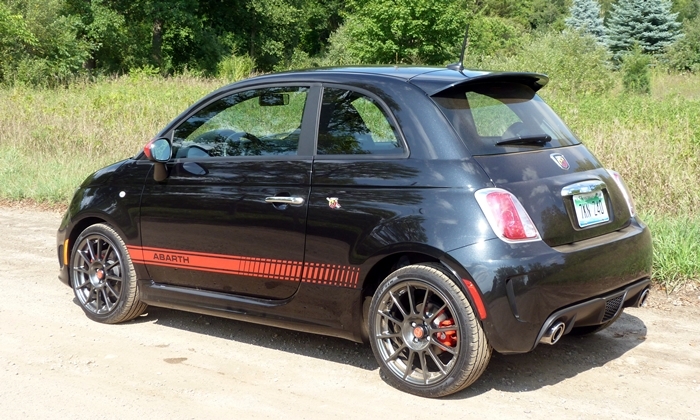 The Abarth doesn't parlay its diminutive dimensions into thoroughly engaging handling. The car's moderately firm steering lacks the tactile nuances of the best. Instead of tingling your fingertips with a direct connection to the road, it seems numb, even in "Sport" (which injects a little more edge). 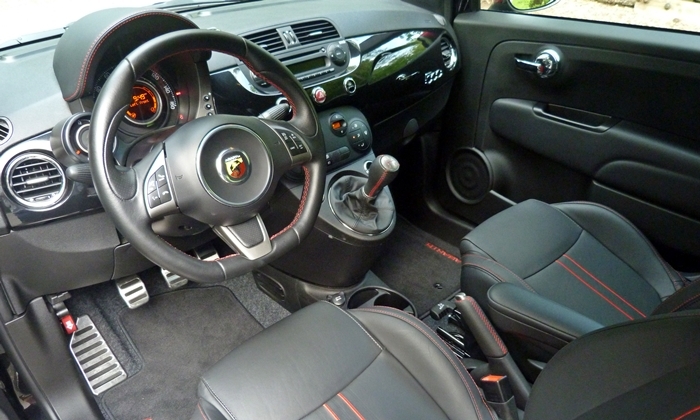 You sit much higher than in a MINI, and the FIAT initially feels tippy. After the initial bit of lean the car does take a set, and the chassis is generally secure, but confidence is not inspired. A MINI, with its lower seating position and superior control over body motions, handles better despite steering that could also be less heavy and more communicative. The materials aren't the best and many of the controls confuse, but the styling inside the car, like that on the outside, entertains and effectively signifies that you're not in a mass market compact hatchback. This said, a MINI interior can be optioned to pack even more visual interest. 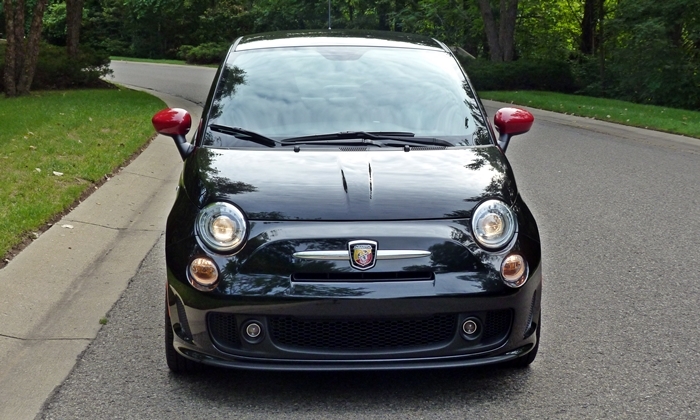 The FIAT 500 Abarth starts at $22,700. Add $1,000 to upsize the wheels from 16s to 17s, and another grand for leather. Does $24,700 seem steep for such a small car with good but not great performance and a limited number of amenities? Well, a MINI Cooper S runs between one and four grand higher, depending on how closely you care to equip it (some MINI option prices border on outrageous). The much-better-in-just-about-every-way Ford Focus ST is also within a grand of the Abarth once feature differences are accounted for. But the FIAT is cheaper than the others, and this counts for something. Why Not the 2012 Fiat 500? Visibility through the large windows is great, and better than in the MINI (which has a smaller, more distant windshield). The driving position is the problem. As mentioned earlier, the FIAT's driver seat feels unnaturally high. Fit a rear seat large enough for adults (in a pinch) into a 140-inch-long car, and there will be trade-offs. The non-telescoping steering wheel is too far away when you adjust the seat based on the pedals, which include a clutch that grabs too near the top of its travel. The dash-mounted, ropy shifter combines both shortcomings. I'd prefer it lower and closer. Big badge on a nose extended to provide space for the Abarth's additional hardware. With a little cooperation from those up front, adults can fit back here in a pinch. The 500's interior materials are okay for a price in the mid-to-high teens. But they come up a little short when the sticker is turbocharged into the mid-twenties. Not that the MINI's are much better, and it's even more expensive. In the end, the FIAT 500 Abarth impresses most with its styling, followed by a decent show from the vocal engine and compact chassis. In most other areas, including some that matter a lot in daily driving, the car falls short. With manufacturers suddenly paying much more attention to the small hatchback segment in the United States, we're bound to get one that's a "must have" before too much longer. This just isn't it. More red, like on a Ferrari! A scorpion, too. Tight, and topped by the smallest cargo cover I've seen, but my usual load of groceries fit. One-week loan. FIAT provided an insured car with a tank of gas for a week. 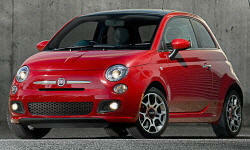 2012 Fiat 500 pros and cons, according to Michael Karesh: the best reasons for buying (or not buying) the 2012 Fiat 500. Join TrueDelta to post your own impressions.